Tales of Mommyhood: touristy fun without leaving our city! touristy fun without leaving our city! One of the items on the list was to walk around downtown and see some of the touristy things Ottawa has to offer. 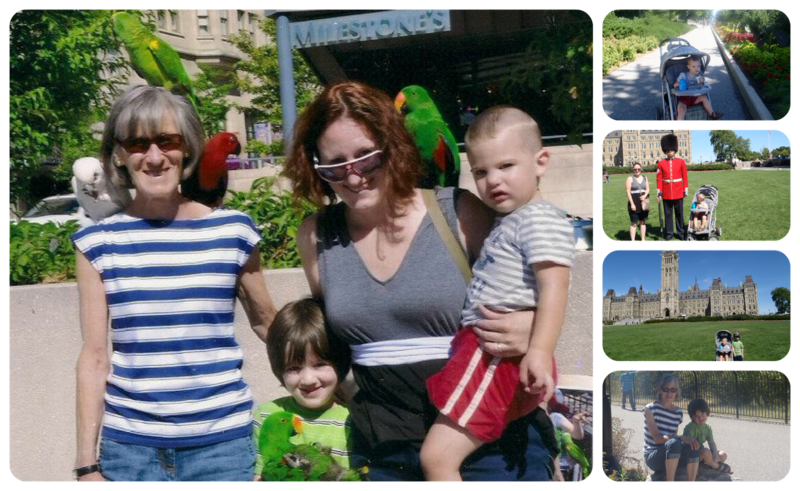 Yesterday was a beautiful day, so my mom and I decided to take the boys out and wander around. Here are a few pics from our day. We started walking up towards Parliament Hill, saw a man with some parrots offering pictures so we stopped and posed - then we continued up to the Hill and watched the ending of the changing of the guard. Kyle was FASCINATED by it - but Julien not so much. When it ended, Kyle wanted to get a closer look at the guards so we went and had a picture taken. We then walked up to the front of Parliament, but decided against a free tour as it lasts approx. 45 minutes. We took a stroll over to Majors Hill Park, the boys had lunch and then we wandered over to the market for a beavertail! Our city is pretty awesome, right? I can't wait for the kids to be one more year older so we can do the same thing. I'm not sure they would fully appreciate it this year so we held off. Instead, we're going to Mont Cascades and the Biodome this week! Can't wait! have fun - I think they will be better next year down there, when Kyle can walk most of it - but it was still a blast! I'd love to see myself what Ottawa has to offer. Canada's capitol is only 4 hours away and I've never been!! Shame on me. Oh I would love to be City Mom in Ottawa! I really love that city! I think your summer bucket list sounds like a great idea!! Discovering one's own backyard is always a pleasure! Ottawa is beautiful! I remember the AWE I had on my first visit! Sometimes it's important to walk in your own backyard! thanks for visiting! yes, get out and explore your own city! I agree sometimes we miss what is in our own backyard! Beautiful pictures! lol fun! bet ya didn't think you were going to have a parrot on you shoulder when you woke up that day! Yah, now I can enjoy my Capital City (and the one I happen to live in) from the confines of my own home (smile). Seriously though, it really is a pretty city with lots to see. I LOVE the market with fish, cheese, breads and of course fresh vegetables! big fan of the market too. I love shopping the stands and getting FRESH and LOCAL produce! You have reminded me that Ottawa is a great place to tour with the kids. I will have to take them downtown to do all the touristy things I take for granted. they (and you) will have a lot of fun! Love playing tourist in your own city. As a young adult, I always opted for traveling the world. I had been to 11 countries, 13 states and 4 provinces. It saddened me to realize I had seen more of the world than my own country. Time to travel in our own 'backyard' and see what where we live has to offer!